Call me paranoid, but I spend nearly every waking moment contemplating whether or not I'd survive a massive nuclear strike. I mean, weirder stuff has happened, guys! Luckily we can now pinpoint our chances with the precision of Google Maps. Would I Survive a Nuke is an aptly named site, giving you exactly the answer to that question with simple graphics and an abundance of apocalyptic options. 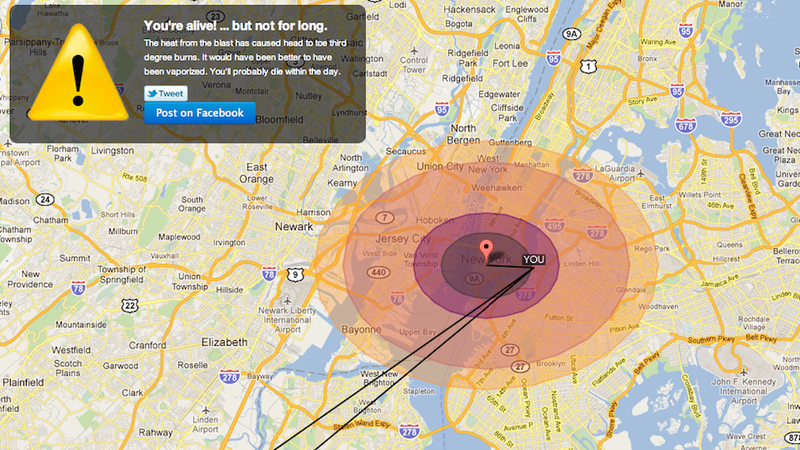 In my scenario, with a one megaton Minuteman missile kicked right into the center of New York City, my outer-borough abode is pretty much screwed: even in Brooklyn, I'm covered in 3rd degree burns and dead within days. Ugh. If only I could handle a longer commute, I might have gotten away with mere radiation sickness. Note: I have a feeling WISaN is a better executed ripoff and/or "implementation" of CarlosLabs' nifty Ground Zero map. So props to them too!